You can tell I’m thinking of bike taxes, right? 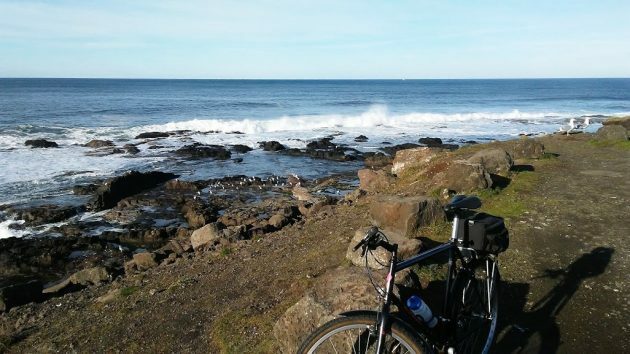 Riding along the Oregon coast at the beginning of 2019, the old idea of bike taxation kept turning in my head despite the sunny brilliance of the day. Somebody had asked me about this on Facebook the other day. Did I think, he wanted to know, that bicyclists should pay a tax to help pay for the part of the road system they use. Yes, I replied, to the same extent that we tax people on foot for using sidewalks and crosswalks set aside for them. Oregon legislators did enact a special bike tax that took effect at the beginning of 2018. How has that been going, I wondered, so I asked Joy Krawczyk, the communications operations manager of the state Department of Revenue. Through the first quarter of 2018, the state had collected $489,000 from this tax, she told me. The cost of collecting this amount was about $110,000, including $66,000 in one-time startup costs. The department expects the continuing administrative costs to drop below the monthly average so far. The tax is $15 per new bike that meets certain characteristics, which basically excludes bikes for little kids but covers everything else. Arithmetic tells us that based on the amount collected, the tax was imposed on the sale of 32,600 bikes over the first nine months of last year. At that pace, Oregonians buy around 43,000 bikes a year. The money is supposed to help pay for things like bike paths. But it’s a drop in the bucket. A single bike path like the long-planned Albany-Corvallis path along Highway 20 will cost millions if it ever gets built, which considering the drawn-out planning process now seems kind of doubtful. As for my ride on New Year’s Day, no tax was involved at all. I was using a Specialized mountain bike that is now almost 30 years old. If and when I have to replace it, I’ll be glad to pay the extra 15 bucks. But despite the rusty spots on its steel frame, it’s still a comfortable ride. So the state will probably not get any bike-related revenue from me any time soon. The bike is way too old for the new tax, but the view seems kind of priceless, no? And just like any other tax or government program, whether it makes sense or not, it will NEVER go away. I ride an 86 Rockhopper as my “grocery getter”. Upgraded to 9 cogs in back on a self built wheel. We both obviously appreciate the old Cr-MO steel frames. Excellent point about while ON a bike, you aren’t IN a vehicle. Interesting come-back. I wonder what the ratio of pedestrians-to-bikes might be? Should there be some proportionality involved? You’re not suggesting a “shoe leather” tax, are you? Well, you just gave someone in government an idea. Read my words. No new taxes. (good luck with that!) Where does it end? It is just $15, not really worth crusading against but a lot of new bikes are mountain bikes that will never even see a mile of paved bike lanes. It makes about as much sense to tax those bikes to build bike lanes as it would to tax hunting rifles and bows to build bike lanes. Using the argument that, “because I pay tax at home and am not using my pickup that does pay tax, I should not have to pay a tax for the use of the roads” if that is reasonable. I should be able to use my quad on the streets because I pay tax at home and my pickup is not using the street, AND it would be using gasoline which does pay tax….. how about my golf cart? it pays as much tax as a chevy volt..
That would make sense if the quad and golf cart were street-legal. As it happens, bikes are and I gather those rigs are not. Hasso, bikes are only street legal because there are very few requirements to make them so. I think most quads and golf carts have as many accoutrements as bikes have; they just have more requirements. But could you imagine quads and carts zipping around downtown? Maybe we should have a “free to use weekend” to try it out. There were bicycles before cars. You should be thankful we allow cars on the road. Hering boasts he is a long term consumer of taxpayer-paid bike paths and all the bicycle accoutrement. 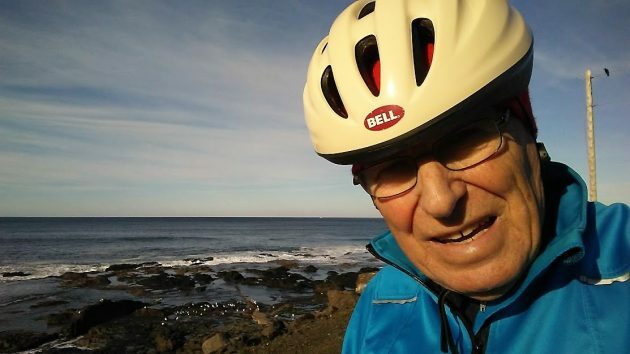 He gloats, even as he directly benefits from the difficult human, legal and legislative effort that went into the creation of bicycle safety, etc. He seems proud to be milking the system. Yet, for decades in the pages of the Democrat Herald and now, in his internet-based assault on truth, Hering ardently supported, and allegedly continues to support, time tested tropes from the bowels of the Conservative/Libertarian belief system – namely that the government is evil, taxes are evil, regulation is evil and politicians are evil. Good try, Hasso. I look forward to your next report. Because Hasso is a conscientious consumer, he maintains his equipment instead of tossing it into the landfill and buying new. It’s time to vote you off the island. I would bet that Hasso has paid far, far more to the state in taxes over his life than you have (or will). His taxes support our schools, roads, fire departments, police, parks, libraries, medicaid, medicare, social security, the myriad state and federal agencies, and yes bike paths. I wonder who is really ‘milking’ the system? It’s definitely not Hasso, but you seem like you are protesting a bit too much. Hasso is merely pointing out, as did OPB, the silliness of implementing a new government program which really will not bring in very much revenue. Is adding another layer of unnecessary government intervention worth the expense? In past posts, Hasso has detailed his volunteering to help the state figure out if a ‘pay by mile’ tax would work for cars in Oregon. This would be a progressive method of maintaining revenue for roads as more electric cars enter the market. Helping the government figure out how to have such car owners pay their fair share of road taxes contradicts all you said in your blinkered and biased rambling of a post. Wasn’t it something about a Stamp Tax and a Tax on Tea that brought this U.S. of A in to being back a few hundred years ago regarding oppressive taxes??? Here today we quibble over the thought of a possible bicycle tax that never was considered in the late 1700’s. Sure hope toilet paper is never taxed!!! Yet again we bicker, bash, & demonize to gain a position over H.H.’s musings. Did ya ever think it was to stimulate dialogue & come up with workable ideas?. In Stalin’s era it was “my way or the gulag” so thanks for our democracy! Thanks for spinning the bottle yet once against the bones of humanity to engage discourse H.H. Actually, no. It was really about the British Government granting an exclusive franchise to the British East India company for all tea (and some other goods) which froze out all shipping traders from the colonies world wide. The effect was to make tea a lot more expensive. Yep! The British cut import duties on tea and gave the B.E.I. a monopoly on tea. That put American smugglers out of business while driving up the cost of tea at Americans’ expense. That’s not to say the British weren’t wrong to grant the B.E.I. a monopoly on tea; that’s protectionism, and runs against the American spirit of free trade with the world. Also, many of the Founding Fathers were appalled with the Tea Party. Ben Franklin even offered to pay for the tea–$2 million, if I remember correctly. Now we drink coffee instead. Ha! … and the rest of your post is spot on.